Saturday: Full infographic plus some extras! If you think of Anthopomorphic trees in legend and pop culture, they tended to be wise and benovolent. Think about the Ents from Middle Earth, Yggdrasil, the Great Deku Tree from the Legend of Zelda etc. However, we do not think of them as giant bloodthirsty aliens hellbent on capturing humans for study and experimentation. But that’s exactly how Guardians of the Galaxy‘s Groot started out back in 1960. A terrifying monster who wasn’t updated to his modern incarnation of the noble, galactic crime fighter until 2007′s Annihilation: Conquest crossover sequel. He was also a lot more verbal than the one-line wonder he is now, though now Vin Diesel is the perfect match to voice him. The modern version we all know now is much more selfless and heroic as a member of the Guardians, befitting his status as the suspected last of his kind. 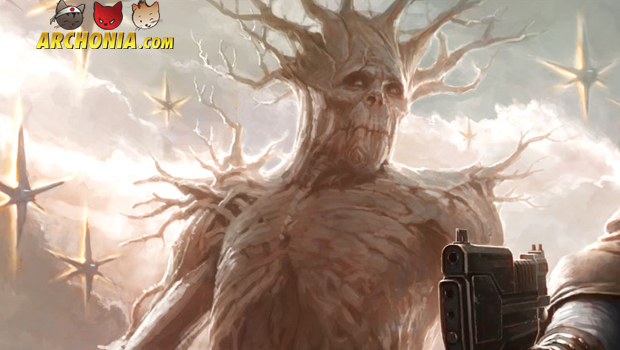 On more than one occasion, Groot sacrificed his life for the greater good of the mission, or to save the rest of his team. Well, alright, he sort of sacrificed his life: The coolest thing about Groot is that, as long as a twig of his survives, he becomes more or less indestructible, able to regrow himself from the tiniest sprig of branch. Also, he’s also able to absorb any form of wood to enhance his strength or regenerate, as well as being able to “sprout,” that is, rapidly growing in size and becoming monstrously strong, but also limited in his range of motion. He also has the nifty trick of being able to summon trees to do his bidding, turning them into attack minions. Unfortunately, Groot does have his limitations. Along with the already mentioned immobility issue when he sprouts, the fully-matured, adult form of his species is so heavy and hardened that his vocal cords have become petrified, leaving him only able to utter the single phrase, “I am Groot!” But those who know Groot well understand he is saying a range of things depending on the tone and inflection of the sentence, and that his limited vocal abilities belie his highly-educated mind and noble upbringing. He is actually a brilliant engineer and physicist, with the finest education that his high-born status afforded him. Despite the difficulty others have in understanding him, Groot and Rocket Raccoon have an iron-clad friendship similiar to the one of C-3PO and R2-D2 – where one is, the other is not far behind, with Rocket being the mouth and Groot the muscle. In fact, Rocket is responsible for saving Groot’s life, nursing one of Groot’s destroyed twigs back to health, keeping it alive until Groot could fully regenerate. 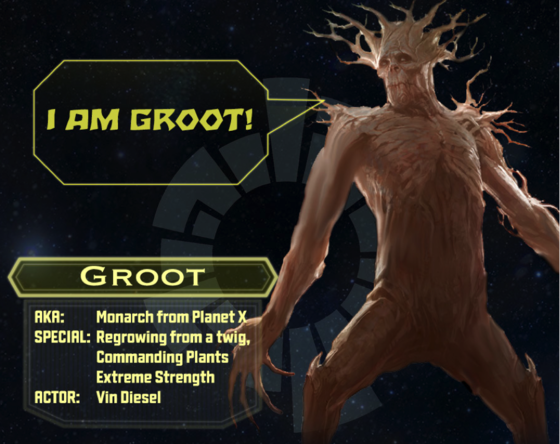 Trivia: Groot’s full title is ‘Divine Majesty King Groot the 23rd, Monarch of Planet X, Custodian of the Branch Worlds, Ruler of All the Shades, Flora Colossus’ according to himself when he first came to Earth in 1960.